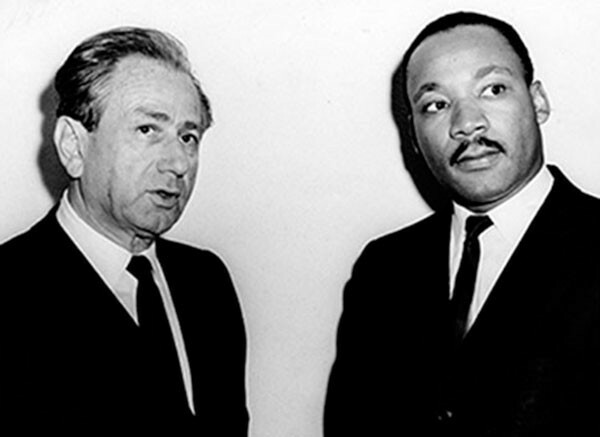 One of Dr. Martin Luther King Jr.’s strongest allies throughout the civil rights movement was Rabbi Joachim Prinz. Prinz was a popular and outspoken rabbi in Berlin in the 1930s, warning Jews to leave Germany as Hitler rose to power. He immigrated to the United States and became deeply involved in America’s struggle against discrimination, seeing it as the same battle he’d been in against the Nazis. As president of the American Jewish Congress from 1958 to 1966, Prinz worked closely with King and spoke at 1963’s March on Washington just before King made his famous “I Have a Dream” speech. His legacy is being celebrated this week with the inauguration of the Prinz Project, which includes a high school curriculum based on his life’s work and culminates next weekend with a musical tribute by the IRIS Orchestra that will premiere a commissioned piece in Prinz’s honor. “If he saw what’s going on in Paris and many other places today, he’d be talking a lot about it,” says his son, Jonathan Prinz, reflecting on his father’s abiding involvement with fighting injustice. Soon after coming to the United States, Rabbi Prinz was invited to lead one of the oldest synagogues in the country in Newark, New Jersey. From that pulpit in a city with a large African-American population, Prinz spoke long and loud about Jewish issues and civil rights issues. He had King come to preach twice to the congregation. King’s speech at the March on Washington has become an indelible part of American history, but Prinz’s speech also carried great weight. Prinz’s life, words and deeds continue to reverberate. The genesis of the Prinz Project came about when a young violinist, Sharon Roffman, asked a composer friend if he would write a concerto for her. Roffman not only got composer Bruce Adolphe to write the piece, but imagined ways to take it even further. She reasoned that the lack of empathy is at the root of violence. It would follow, then, that music could make a difference. “I have this very romantic, ideological belief that if more people felt that and thought about that, it would change the way they view the world and behave with other people,” she says. Roffman reached out again to Adolphe to do the concerto. Soon Roffman and Adolphe were meeting with IRIS executive director Dave DePeters and the project came to life. Stern said the idea that Roffman and Adolphe presented clicked immediately. “When you get an interesting idea from interesting people, it’s hard not to be interested,” he says. Roffman also has had to find time to work on Adolphe’s concerto, and it’s presented a bit of a different challenge. For Rabbi Prinz’s son, the fact that music is being used as a tribute is entirely fitting. Adolphe’s composition taps into the kind of presence that Rabbi Prinz had.